Like overeager runners at the starting line, stem cells sometimes jump the gun, disqualifying themselves and losing the chance to enter the winner’s circle. For would-be therapeutic stem cells, the winner’s circle is a transplantation site. 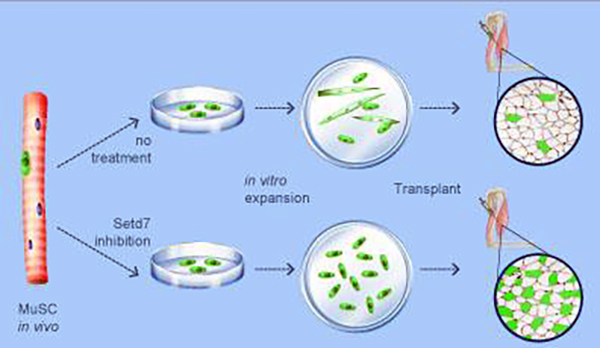 It can be reached only if stem cells pace themselves and avoid differentiating too soon. To keep stem cells from differentiating prematurely, scientists based at the University of British Columbia (UBC) have developed a drug that helps regulate the transition between activated, proliferating stem cells and differentiation-primed, poorly engrafting progenitors. The drug, which has been tested successfully in mice, inhibits the methyltransferase Setd7. Setd7, the UBC scientists learned, plays a role in controlling stem cell growth and their maturation into muscle fibers. Using their Setd7 inhibitor, the scientists were able to prevent immature, transplantable myogenic stem cells (MuSCs) from differentiating so that these cells could continue to divide. Then the scientists implanted the stem cells into the hind leg of mice affected by a mouse model of muscular dystrophy. Upon transplantation, the article’s authors continued, both mouse and human MuSCs expanded with a Setd7 small-molecule inhibitor “are better able to repopulate the satellite cell niche, and treated mouse MuSCs show enhanced therapeutic potential in preclinical models of muscular dystrophy.” Essentially, the UBC team found that the cells fused to the muscle, regenerated the tissue, and improved the strength of the muscle. Stem cells hold promise for diseases such as muscular dystrophy because of their ability to differentiate or produce new cells that can form into specialized tissues in the human body. In theory, stem cells could replace damaged tissues with new tissue, unaffected by disease. However, scientists have had difficulty developing successful treatments, especially for muscle, because once the stem cells are isolated in a lab dish, they stop simply being stem cells and begin to differentiate. In this case, the muscle stem cells stop dividing and become muscle fibers, which do not transplant well. “This discovery unveils a new method to boost the therapeutic potential of muscle stem cells, allowing these cells, when transplanted into damaged tissue, to facilitate tissue regeneration and improve muscle function,” said Robert Judson, Ph.D., postdoctoral fellow at UBC, senior scientist at Stemcell Technologies, and lead author of the paper. Muscular dystrophy is a rare degenerative genetic disorder that causes progressive muscle weakness over time. The most common form of the disease affects approximately one in 5000 men and shortens life expectancy considerably. There is currently no cure for muscular dystrophy.